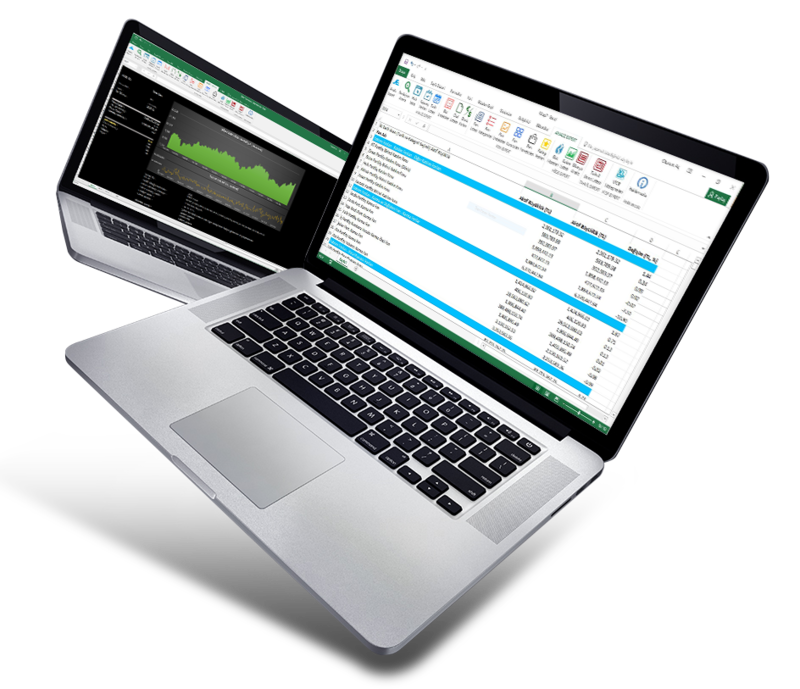 Analysis Expert is an analysis and reporting software that delivers more than 10,000 datasets instantly into your Excel by superior and fastest software infrastructure. 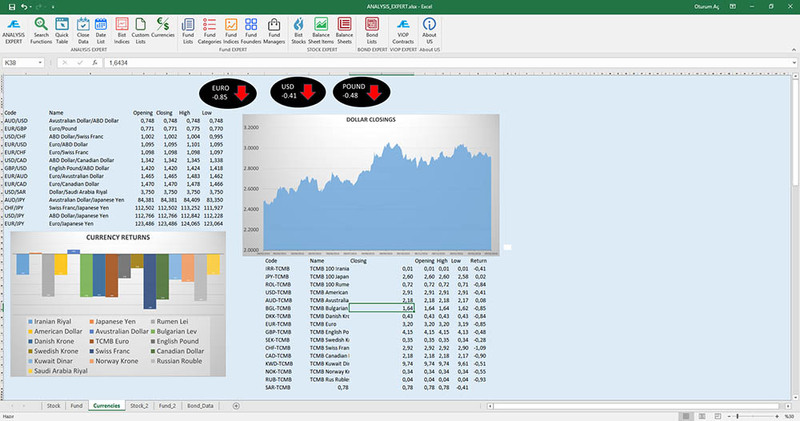 Finnet Analysis Expert is a software that provide to analyze detailed datasets on Turkish Capital Market Securities in Excel environment. Get datasets directly into your excel spreadsheets, create easily customizable templates and start your analysis. Make a difference with the meaningful ratios of investment products which prepared by market professionals. Create time series, update your reports, and accelerate your analysis by modern software technologies. Finnet Analysis Expert is the first choice of financial sector professionals with it's qualified and extensive database. 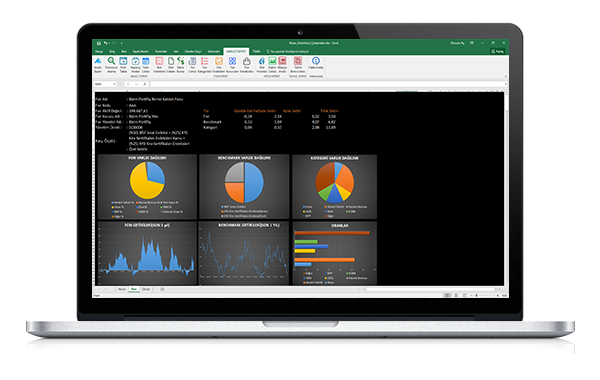 Utilize this powerful tool to easily extract data from extensive database while also leveraging the benefits of Microsoft Excel. WHICH MODULES DOES ANALYSIS EXPERT INCLUDE? 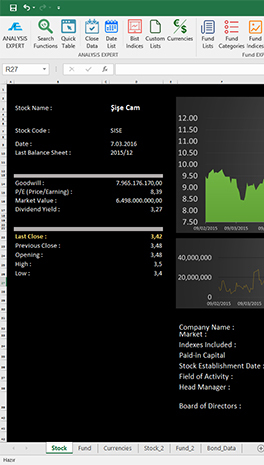 Stock Expert Module involves balance sheets, income statements, food notes, detailed balance sheet analysis, capital increase and dividend tables, balance sheet items and ratios, historical prices, volumes, returns, statistics and hundreds of derived data of companies since their initial public offering date of Istanbul Stock Exchange. 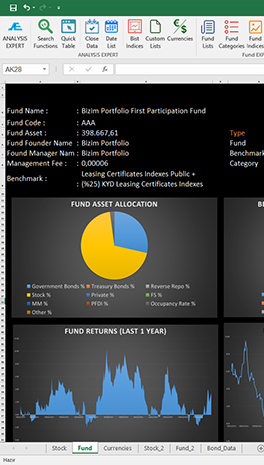 Fund Expert Module helps you to retrieve asset size, portfolio size, asset allocation, investor size, fund market weight, gross and net returns, performances, benchmarks, founders, manager and categories of Mutual and Pension Funds. Fund Rating Module also has rates of Mutual and Pension Funds that evaluate by two different rating corporations. Bond Expert ensure to access all reference financial data of Debt Market. It includes analytics and detailed information of bills, bonds and private sector fixed incomes from issue date until today. Future Expert allows you to retrieve future and option contracts data sets which trade in Turkish Derivative Market. You can dynamically integrate the future and option datasets to your analysis by Future Expert’s components. Most complex calculations can solve easier and faster with Future Experts functionality. Warrant Expert Module delivers stock warrant’s daily prices, volumes, contract sizes and leverages, greeks like delta, vega, gamma, theta, rho, omega. It also provides warrant’s profile, issuer, underlying and maturity information data. 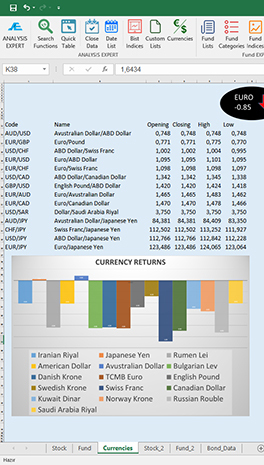 Macro Expert allows to download all economic indicators directly into your Excel Spreadsheets. You can rapidly make research and analytics by individual Excel functions and well organized data. Macro Expert gives you opportunity to understand market and economics in the light of macro economic indicators. Commodity & Currency Expert helps you to get time series data of currencies, parities, currency baskets, CBRT exchange rates, precious metals, foreign indices and commodity prices by individual formulas. Finnet provides you a software development environment by more than 1200 formulas which also include Turkish Capital Market datasets. Analysis Expert API ensure to create a private dynamic structure for your software development projects by extensive and functional contents. Analysis Expert API is a suitable solution for financial software projects with common functions and database connection. Finnet Analysis Expert is a software which developed with our 22 Years capital market analysis software development experience. 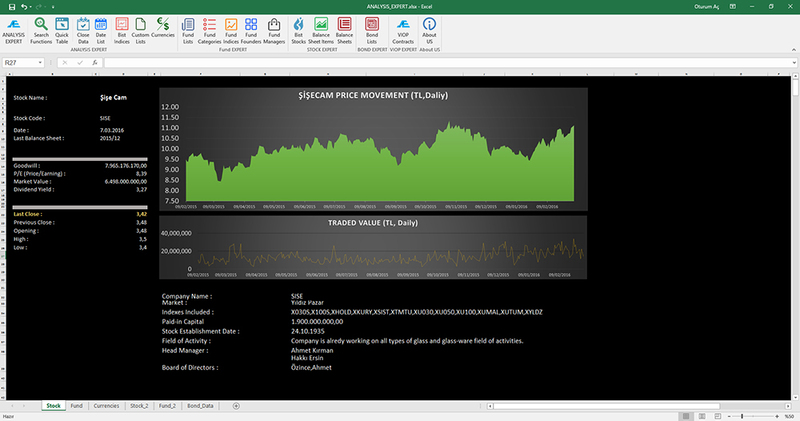 Finnet Analysis Expert developed by software developers who can understand financial market data and analytics. 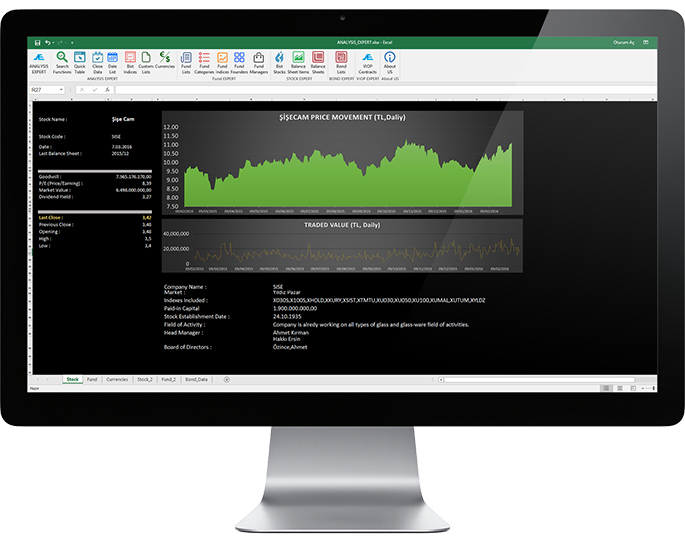 Finnet Analysis Expert ensures a flexible and powerful analysis platform. Finnet Analysis Expert gained from feedbacks of investment companies, banks, public companies, asset management companies professionals and academicians. Finnet Analysis Expert’s accelerate your calculations by native excel functions and templates. Finnet Analysis Expert is enable to access ready-to-use report templates on Analysis Expert report screen. You can easily customize these templates by your preferences. Finnet Analysis Expert involves extensive database about Turkish Capital Market. You can subscribe separate modules as you need by its moduler structure. AE enable to 24/7 access to your works. Finnet Analysis Expert keep databases on your local drive. So, you just need to update current data from internet. You can access all your historical data without online data feed. HOW DOES FINNET ANALYSIS EXPERT WORK? 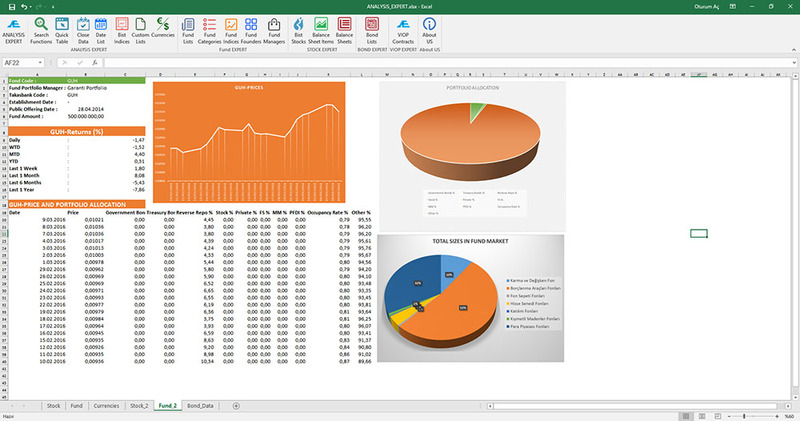 Finnet Analysis Expert is an Excel Add-in. You can directly download setup files for installation after your subscription. Contact our support team further information of installations. You can be member from www.finnet.gen.tr and complete subscription process. You may send your wishes and request to Finnet Support Team from your user panel. Simple Installation, Practical usage, More than 1200 Functions. Rapidly install Analysis Expert to your computer and prepare your spreadsheets by user friend analysis tools. Powerful function infrastructure can fetch the data instantly as your exact needs. Special report creation interface gives you to access to create unlimited and handy report templates. All of your reports are always updated. You can easily get new data and updates of the software in a split second by modern software infrastructure and self-acting update tool. We present a timesaver technology to make your financial research and analysis easier. Powerful and trustful database, fast calculations and data screening accelerates your works. Finnet offers an unlimited support service during your subscription period. Finnet Support team responds your requests as soon as possible. What are Advantages of AE? Retrieve mutual and pension funds’ performance, asset allocations, benchmarks and daily information since inception. What are Finnet Analysis Expert features? Reports will always be updated. AE helps you to list all financial instruments, indices or categories in your spreadsheets. So, you can easily analyze them. 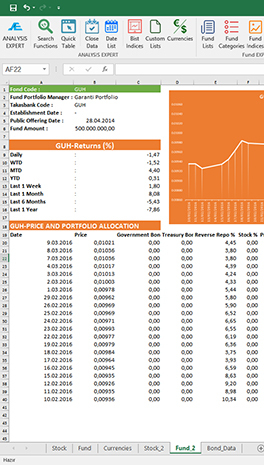 Finnet Analysis Expert keeps daily, weekly, monthly, yearly data sets of different investment instruments in database. All data are one click away from your spreadsheets. So, you don’t need to buy different databases as data source. Close Data tool enable to download most useful data of any investment instrument for given period within seconds. Equity Module of Finnet Analysis Expert involves public company’s balance sheets. You can bring financial statements of companies from their first announced balance sheet until last. So, Equity Module supports you to make detailed fundamental analysis. AE ensure you get multiple balance sheets belongs different companies. Multiple balance sheets tool supports you to make comparative analysis between companies rapidly. 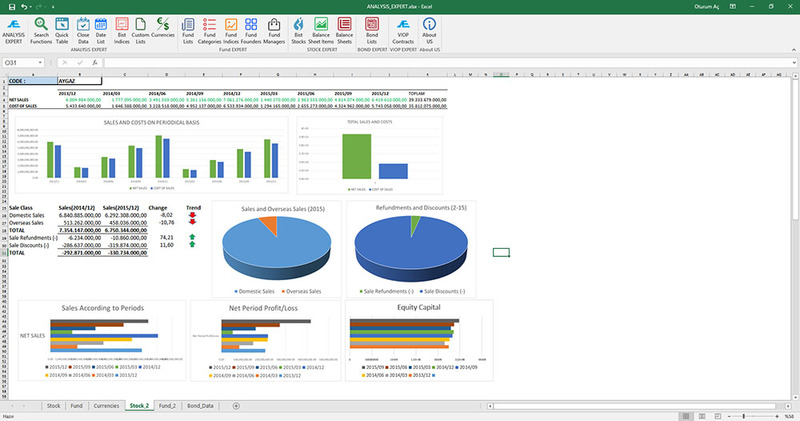 Analysis Expert Report Screen saves you to turn your computer upside down for your spreadsheets. Report screen helps you to create your reports and save your private user database. Finnet Analysis Expert includes ready to use analytic reports of stock market, mutual and pension funds. You can easily edit them as you wish. 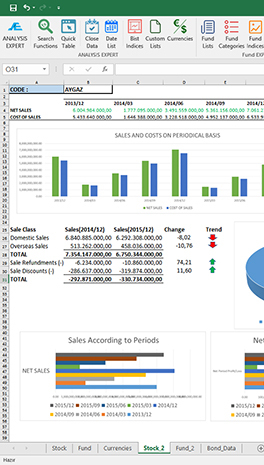 These templates also enable to export from report screen to excel spreadsheet. Finnet’s database involves oldest financial data of market. Date list tool helps you to separate holidays and interaction days. It helps to list work days as daily, weekly, monthly and yearly forms. Analysis Expert supports Turkish and English languages. You can save your favorite functions and simply reach to them from your favorite function list. 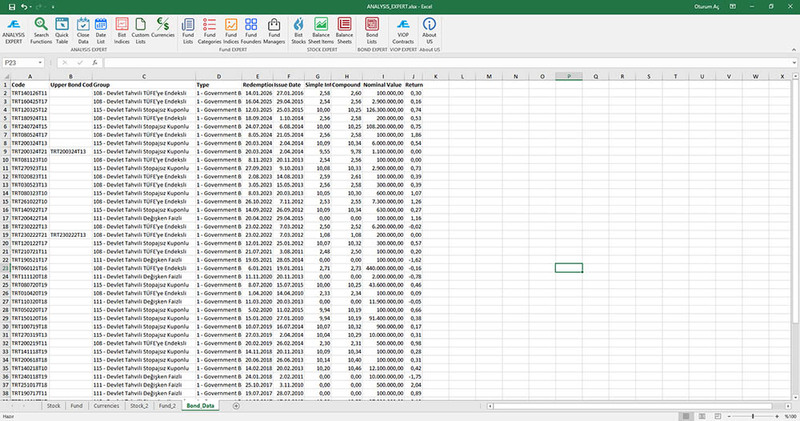 Ratio and statistics functions save you to prepare massive and slow excel spreadsheets. This functions help you calculate base indicators of financial markets like statistics and ratios. Finnet Analysis Expert update tool automatically updates your data in minutes. Finnet Analysis Expert data feed solution allows to access Finnet’s servers directly. So your reports will always be updated. 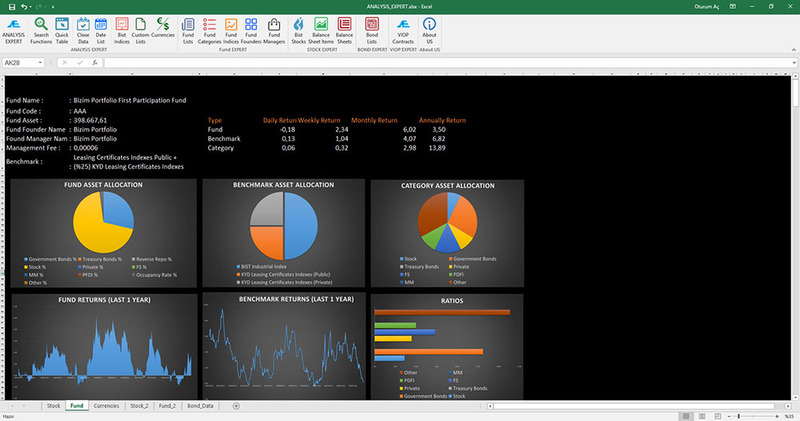 Can anybody use Finnet Analysis Expert who has experience on excel? Does it include ready to use functions? Does Analysis Expert have data about all Turkish Capital Markets? Does It have historical data of investment instruments? Do we get daily-weekly- monthly period data? Do I define my formulas? Do I create reporting templates? Do my tables update automatically? Is Finnet Analysis Expert software fast? Does It include all data about Istanbul Stock Exchange? Does It include daily close prices? Do I analyze public companies? Are public company’s capital increase and dividend tables available in AE? Can I retrieve the company’s balance sheet at announcement date? Can we get fund market data? Does It have fund indices? Does It include public company’s news? 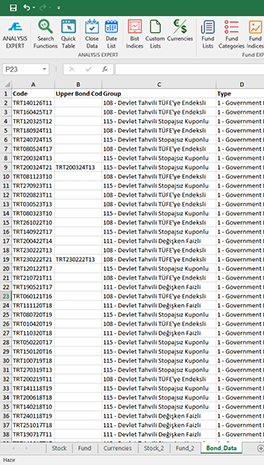 Are enable access of Turkish Derivative and Bond market data? Can we import gold and currency data? Does it include yield and specific statistics ratios functions? Can I be a subscriber as retail investor or academician? Can I buy modules separately? Are currency and gold market data available? IF YOU HAVE FURTHER QUESTIONS, PLEASE FILL OUT THE CONTACT FORM BELOW. Support team will contact you. Copyright © 2016 FINNET. All rights reserved.